The Russian naval flag was hoisted on the second nuclear-powered Borey Class missile strategic submarine cruiser, which will join the Pacific Fleet. On December 23, the Russian Navy received a New Year’s gift. 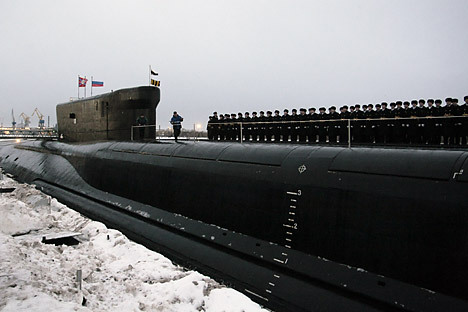 The Severodvinsk Engineering Plant held a solemn ceremony, hoisting St. Andrew’s flag (the Russian naval flag) on the first series-produced (and second manufactured) hull of a Project 955 Borey Class missile strategic submarine cruiser with 16 Bulava strategic missiles onboard – the Alexander Nevsky. The ceremony of admitting the new cruiser into the Russian Navy was attended by the Minister of Defence, General of the Army Sergey Shoygu, Navy Commander-in-Chief Admiral Viktor Chirkov, and chairman of the government committee for commissioning this nuclear-powered cruiser, Rear-Admiral Igor Fedorov, who signed the Delivery-Acceptance Certificate for the submarine together with Mikhail Budnichenko, general director of the plant. The ship that was laid at the Sevmash Plant in 2004 is now part of the Pacific Fleet of the Russian Federation and will be on active service at the Volyuchinsk Naval Base in the Kamchatka Peninsula. In anticipation of its arrival, dormitories for the vessel’s crew and the berth with all necessary pipeline connections have been built at the base. The Minister of Defence Sergey Shoygu reported to President of Russia Vladimir Putin, from a video-conferencing room of the vessel, about admission of the Alexander Nevsky into the Navy. In his turn, Putin noted that the admission of Alexander Nevsky into the Russian Navy is an important day not only for the Armed Forces, but for the entire country as well. The Supreme Commander-In-Chief emphasized that the Alexander Nevsky is a brand new, modern and perfect nuclear-powered missile submarine, and that Borey Class vessels like this should become the main component of the naval element of Russia’s nuclear triad. The first Borey Class missile submarine, the Yury Dolgoruky was admitted to the Northern Fleet and is on active duty at the Gadzhiyevo Naval Base. “As we know, by 2020, the Navy should receive eight Borey and Borey A Class missile submarines. Thus we will have completely upgraded the naval element of the Russian nuclear forces.” He added that besides the Borey submarines, the Navy should receive eight Yasen Class all-purpose nuclear submarines by 2020. “The Severodvinsk Plant has almost completed construction of the first submarine of this series – the Severodvinsk,” Putin added. The Russian President reminded people that the Yury Dolgoruky, the first Borey Class submarine, had been commissioned in January 2013. Construction of the second series-produced submarine of this type, the Vladimir Monomakh, should be completed soon. “Next year, it shall assume combat duty as well,” announced the Russian Supreme Commander-in-Chief. First published in Russian in Nezavisimaya Gazeta.